Maverick MMA held Maverick MMA 7 tonight at the Econo Lodge in Allentown, PA. Organizational featherweight champion Scott Heckman put his featherweight title on the line against challenger, Ryan Kim Cafaro. 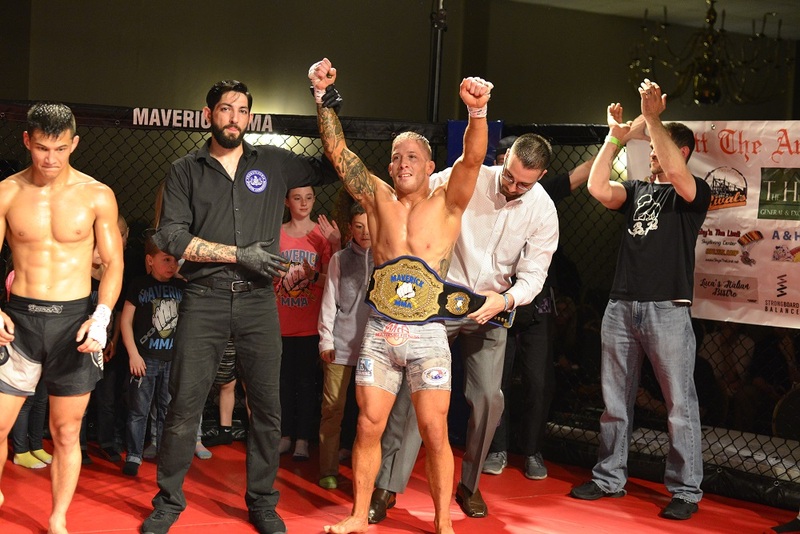 Heckman has been with Maverick MMA since the promotion’s debut, where the 145-pound champion has not lost a fight since his return to the sport. 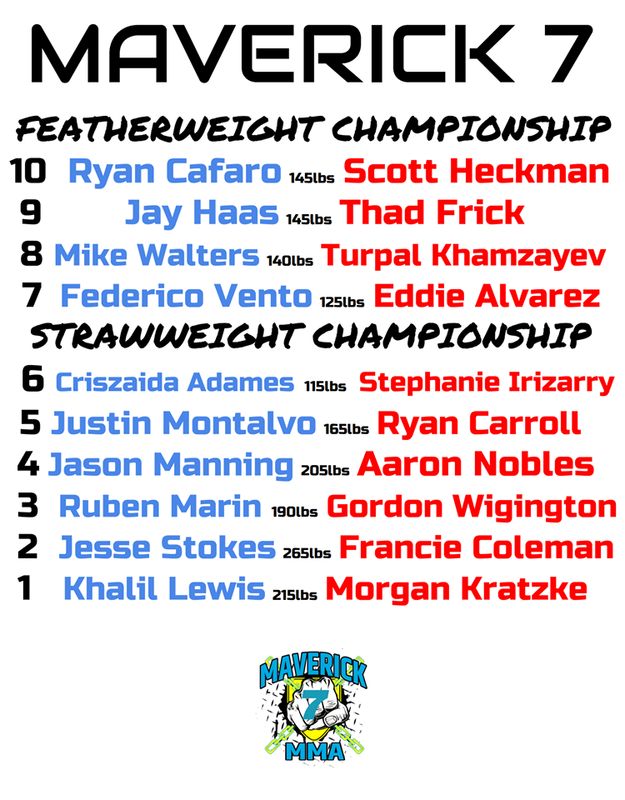 Tapology.com has Heckman ranked currently as the #4 featherweight in the state and 10th in the northeast, while Cafaro is ranked #8 in the Keystone state and 18th in the northeast. Heckman, 33, has won five consecutive fights since coming out of a brief retirement from the sport of MMA, all under the Maverick MMA banner. Of the five bouts, three were submission finishes, and three were title defenses. His storied professional MMA career dates back eight years to 2010 and tells a tale of 26 wins with 8 losses. Around the same time that Heckman was turning pro, Cafaro was beginning his amateur career. “Korean Thunder” made the leap to the pros at Bellator 108 in 2013. He arries a 6-2 pro record to the cage on Saturday. The winner of this fight could easily be the next featherweight competing for a UFC contract on Dana White’s Tuesday Night Contender Series. In the night’s co-main event Jay Haas, who challenged Heckman for the 145-pound title earlier this year met Heckman’s training partner, Thad Frick. Haas entered the cage competing with a lot on his mind, losing his father earlier this week. The strong-willed competitor chose to compete despite the family tragedy. 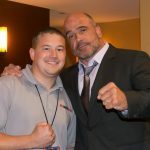 MyMMANews expresses their condolences to the Haas family. The night opened up with a 10-bell salute in memory of Steven Haas. K-Dojo Warrior Tribe’s Turpal Khamzayev made his pro debut against Mike Walters, who also made his debut. Earlier this week Khamzayev told MyMMANews that he had no choice but to go pro after eight amateur fights fell through. Federico Vento made his return to the Maverick MMA heptagon, all the way from Hawaii. He met “The Panamanian Devil” Eddie Alvarez. The card opened up with Morgan Kratzke connecting his heavy hands with the face of Khalil Lewis. Kratzke made quick work of Lewis, dropping him with big shots, pouncing on his back and locking in the rear-naked choke. Lewis spit out his mouthpiece and tapped seconds later. The heavyweights hit the heptagon next with Jesse Stokes and Francie Coleman. This fight was supposed to happen for another organization but never came together until tonight. Coleman tried taking Stokes down, but Stokes stayed on his feet, reversed the switch and got Coleman to the canvas. From there he began to pepper Coleman’s body with strikes before submitting him with a rear-naked choke. Gordon Wigington connected with several kicks to the body of Ruben Marin, echoing throughout the ballroom at the Econo Lodge. Marin followed up with a few shots that rock Wigington, backing him up against the cage. Before you knew it the first round was over and they were trading shots to open up the second frame. Wigington gets Marin down with a trip, Marin stands back up, and Wigington throws him back down. No damage done on the ground but the round definitely goes to Wigington. Wigington gets a takedown early in the third and Marin immediately goes to full guard. Wigington controls top position throughout the round and earns a unanimous decision. 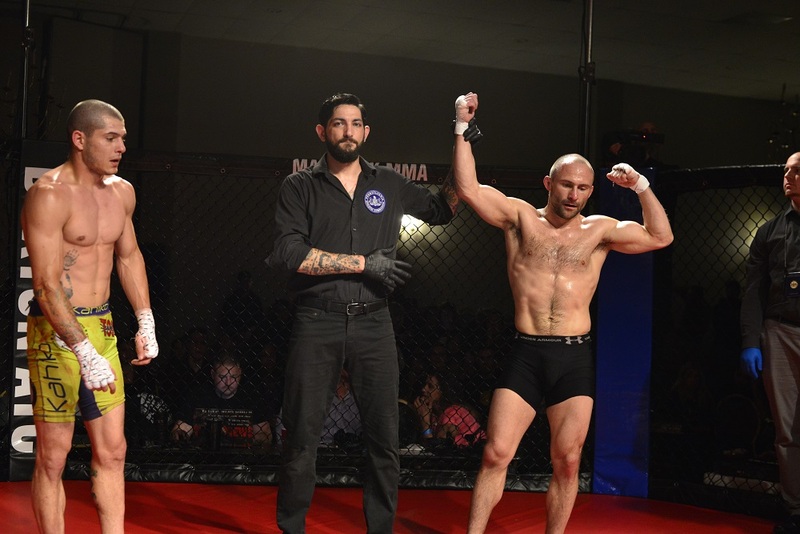 Jason Manning and Aaron Nobles went toe-to-toe in the light heavyweight division. A lot of fighting off the cage in this one. Manning keeps Nobles’ back to the wall while landing knees to the body. With ten seconds left in the second round they come out swinging. Noble has a nice mouse developing under his right eye as the pace picks up here in the final round. Manning works for a submission on the arm of Nobles in the final ten seconds of the fight; not being able to get the tap, this fight will go to the judges. Manning wins unanimously. Ryan Carroll of Miller Brothers MMA has pro fighters Sean ‘Shorty Rock’ Santella and Jim Fitzpatrick for his 165-pound fight against Justin Montalvo. Carroll throwing punches right down the middle. Works for a takedown, ankle pick, while Montalvo is pressed up the cage. Unable to get his opponent down, Carroll meets Montalvo back in the center of the cage and they exchange strikes. Carroll has a cut above his left eye. Carroll is getting flashy with spin kicks and spinning backfists in the second frame. Carroll goes for a second takedown and is unable to complete. Referee Jimmy Chappell temporarily stops the fight for the cageside physician to look at the cut above Carroll’s eye. The fight resumes and they are throwing leather once again. The two men continue to brawl throughout the final round, a fun back and forth war but it is Montalvo who is landing the cleaner, crisper shots. He wins unanimously on the scorecards. 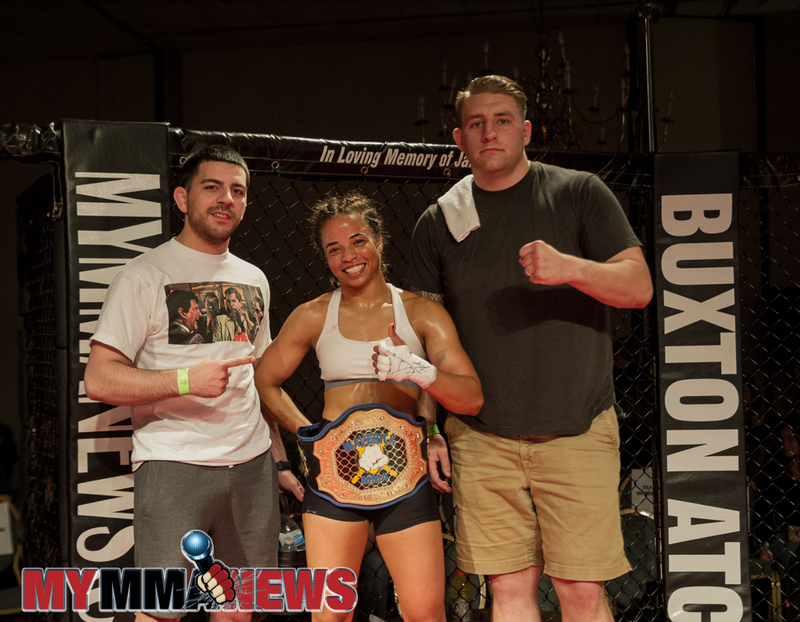 Criszaida Adames and Stephanie Irizarry battled it out for the Maverick MMA advanced amateur strawweight championship. Irizarry attempts a spinning backfist and Adames is able to capitalize, grab a leg and get her opponent down to the canvas. Adames throws down a few shots from the top. With this fight having advanced rules she is able to punch to the head of the downed opponent. The round ends with Adames working to lock up a kimura before the bell sounds. Lots of hands thrown in the second frame. Adames seems to be one step ahead when connecting. Irizarry keeps coming forward, not backing down. Coach Erik Purcell is yelling at his fighter Irizarry to complete a takedown, but no attempts are taken. Irizarry working off her back early in the third round, has a good rubber guard. The crowd is the loudest it has been all night as Irizarry is moving from submission attempt to submission attempt. She goes from triangle to armbar before Adames survives and escapes. The bell sounds and we go to the judges. Adames is your new Maverick MMA strawweight champion. It was then announced that David Juliano will defend his flyweight title against Charles Wallace on June 23. The first fight following the intermission was a flyweight bout between two extremely fast competitors in Federico Vento and Eddie Alvarez. Vento connects off the bat with a big right hand. Alvarez gets Vento down to the canvas, but Vento is able to work to back control and attempts a rear-naked choke. Alvarez escapes and they work to the feet. Vento brings Alvarez back down, lands a few shots and then submits Alvarez via rear-naked choke in the first round. 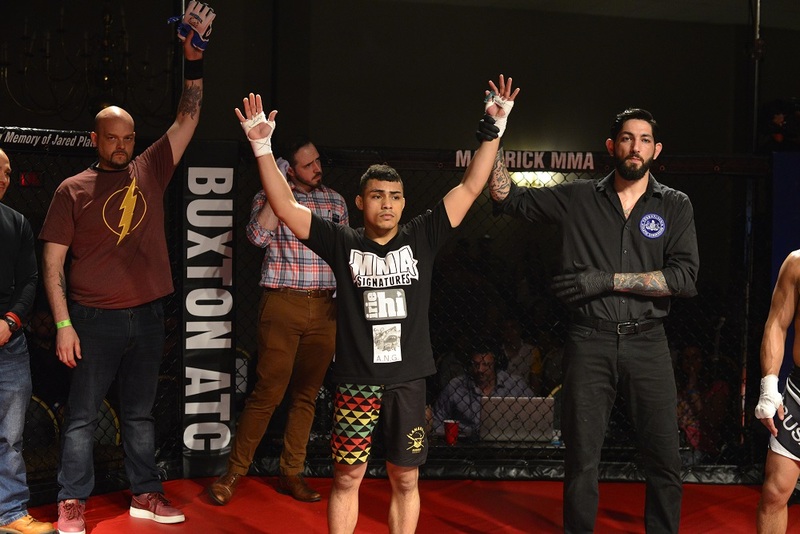 Vento takes the win back to Hawaii with plans to return back to the Maverick MMA cage later this year. Mike Walters and Turpal Khamzayev came out swinging right out the gate. Once the fight hit the ground Khamzayev began the assault, working elbows from the top. Once they stand back up Khamzayev lands a brutal low leg kick followed by a big right hand. Once Walters drops, Khamzayev follows up with a punch as Walters tries to stand back up. Walters now on top in full mount, throwing down punches before transitioning to an armbar. Khamzayev escapes and begins working for his own submission. This is a fantastic fight. Both fighters scrambling from position to position. After a brief exchange of hands in the second round Khamzayev takes his opponent down but smacks his own head off the canvas in the process. Still with it, Khamzayev works for the back. A few seconds later Walters has his back and puts Khamzayev out with a rear-naked choke. Fantastic fight from two fighters both making their pro debuts. The Ares Combat Sports Academy fighter in Walters gets the win. An early takedown from Thad Frick put Jay Haas on his back early. He began working for submissions and avoiding the punches thrown down by Frick. Haas landed an upkick that hurt Frick, but Thad was able to regain his composure and keep Haas down on the mat. Haas eventually worked his way to his feet but did not fully engage after throwing one punch. Frick came back and connected. The fight goes back down to the ground and Haas works and armbar, fully extending at the sound of the bell. Haas lands a huge headkick in the second. Frick gets the fight back down to the ground, Haas lands an elbow from the bottom. Frick is busted up, it appears as if blood is flowing from his nose. Frick continues to push forward from the top but is not really doing any damage from the position. Haas locks in a guillotine but Frick escapes. Now Frick on top, takes the back of Haas and forces the tap from a rear-naked choke. Scott Heckman and Ryan Cafaro capped off the night with the main event, featherweight title fight. No glove touch on this one. They come out with a fast pace, Cafaro connects with a head kick. They exchange leg kicks. Cafaro lands a flying knee. Heckman gathers his composure and works for a takedown. Cafaro connects with a front kick. Cafaro begins to hit Heckman with a few jabs. Heckman complains of a low blow, but the ref does not halt the action. Heckman upset, shoots in and takes Cafaro down. They get back up, Heckman stuns Cafaro with a shot. The fight gets back down to the canvas where Heckman worse for his D’Arce choke. Heckman gets mount and works a guillotine from the top, but Cafaro gives the thumbs up. The sub attempt is lost and they scramble. Cafaro lands an upkick. Heckman ends the round trying his choke again. Heckman connects first with a jab in the second. Cafaro comes forward with shots but is taken down by Heckman. Heckman working to keep control of the round and the fight. They stand and Cafaro stalks down Heckman, landing thundering body shots. Heckman takes him down again. The rounds ends and it appears as if the champion is up two rounds to none. Heckman signals to touch gloves to open up the third round and Cafaro won’t have any of it. Cafaro goes in for a flying knee and Heckman catches him and takes him down. Cafaro is relentless in keeping Heckman from submitting him with that D’Arce choke. They stand up, Cafaro throws a knee, Heckman takes him right back down again. Heckman has back control and throws body shots. With 30 seconds left in the fight Heckman stands above Cafaro and throws down a punch, followed by a kick and walks away. The 10-second buzzer sound and Cafaro stands up and connects with a flying knee. The fight goes the distance. Heckman retains the gold once again by way of decision.